The militant group Sinai Province is the most active insurgent group in Egypt. 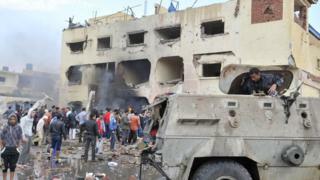 It has been linked to a number of deadly attacks, mostly in North Sinai, but also in the capital, Cairo, and other provinces. The Islamist group, initially known as Ansar Beit al-Maqdis (Supporters of Jerusalem), has been active in the Sinai Peninsula since 2011. It changed its name after it pledged allegiance to the so-called Islamic State (IS) group in November 2014. In 2015, Sinai Province staged a series of attacks against the army, whose scale and complexity indicated the possibility of closer coordination with the IS leadership in Syria. Sinai Province is thought to be aiming to take control of the Sinai Peninsula in order to turn it into an Islamist province run by IS. The number of active Sinai Province members is believed to be between 1,000 and 1,500. It has expanded its operations outside Sinai by creating cells in some governorates, including Cairo and Giza. These cells have claimed several attacks, including one on a security building in the northern province of Dakahliya in December 2013, which killed at least 15 people and injured over 100. The group's operations have also reached the Western Desert, an area popular with tourists for its oases and rock formations, but which has also become a militant hideout due to its proximity to volatile Libya. Sinai Province has been operating mainly in North Sinai, which has been under a state of emergency since October 2014 when 33 security personnel were killed in an attack claimed by the group. The then Egyptian prime minister, Ibrahim Mehleb, described the army's confrontation with Sinai Province as a "state of war". North Sinai is thinly populated and broadly underdeveloped, with some of the local population feeling marginalised from the government's investment programme on the mainland. The sense of disconnect is seen as helping fuel a level of support for the militants there. The border with Israel and the Gaza Strip has been a scene of tension over the past few years. The Egyptian authorities have created a buffer zone, demolishing houses and digging a trench to prevent smuggling between Egypt and Gaza - which they say is a source of weapons for the militants. In September 2015, the Egyptian army launched a large-scale military campaign against militant groups in North Sinai. The ongoing Operation The Martyr's Right targets sites mainly in Rafah, Arish and Sheikh Zuweid, all towns in northern areas of the peninsula. As part of the offensive, the army pumped water from the Mediterranean Sea into the tunnels along the Gaza border. Sinai Province started by attacking Israel with rockets, but after the removal of Islamist President Mohammed Morsi in 2013 it focused on Egypt's security services, killing dozens of soldiers. It has been involved in suicide bombings, drive-by shootings, assassinations and beheadings. In July 2015, the group said it had attacked an Egyptian naval vessel in the Mediterranean with a missile fired from the shore - a worrying development for shipping in the region. After the launch of the military campaign in North Sinai in September 2015, the group changed its strategy again by carrying out frequent small-scale bombings and hit and run attacks rather than intermittent "spectaculars". A survey conducted by London-based Al-Araby al-Jadid news website said the group had carried out more than 31 attacks in various areas across Sinai within just a two-week period in March 2016. Sinai Province has developed a media production operation, and has published a host of propaganda videos online. One entitled The Soldiers' Harvest and released in September 2015 featured several attacks the group said it carried out against security personnel. These included shooting policemen in the street, sniping at army soldiers, and targeting military vehicles with explosive devices. Another video released in March 2016 allegedly showed training camps in a desert area where members of the group received combat training. In other videos, the group has urged citizens to avoid cooperating with the authorities, especially by joining the army and police. In some of its films, the group has softened its tone towards the Muslim Brotherhood, who it previously criticized for adopting "infidel democracy" and joining the political process. In a video released just few days before the fifth anniversary of the 25 January 2011 revolution, Sinai Province called on what it described as "supporters of peacefulness" - a reference to the Muslim Brotherhood - to rise up against President Abdul Fattah al-Sisi.